Karnan, who was arrested on June 20 in pursuance of the apex court's judgement awarding him six-month jail term for contempt of court, has requested urgent listing of his petition seeking bail and setting aside of his conviction. New Delhi: The Supreme Court today refused to accord urgent hearing on a plea of former Calcutta High Court judge, Justice C S Karnan, seeking bail and recall of the order convicting him for contempt. "Declined. We will not accept an oral request against the judgment," a bench comprising Chief Justice J S Khehar and Justice D Y Chandrachud said. Advocate Mathews J Nedumpara, representing Justice Karnan, said that he has been serving the jail term and his petition needs to be heard on an urgent basis. On June 21, a vacation bench of the apex court had refused to entertain the plea of the arrested ex-high court judge saying it "cannot override" the seven-judge bench order in the case. Karnan, 62, who retired on June 12 as Calcutta High Court judge, was arrested on June 20 by the West Bengal CID. He had been in Coimbatore since May 9 when the apex court held him guilty for contempt of court and sentenced him to six months imprisonment. 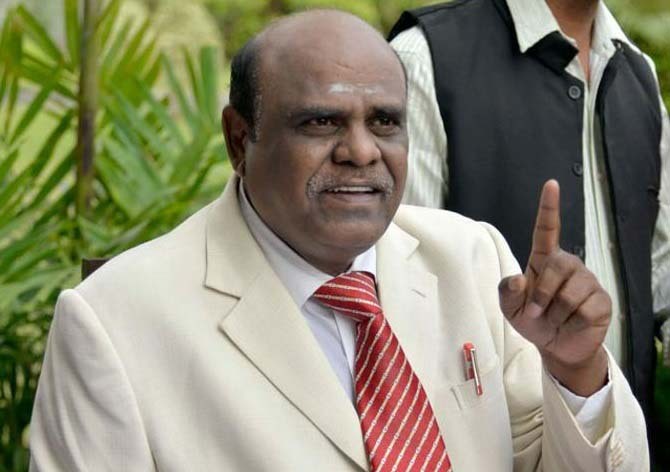 Karnan has the dubious distinction of being the first sitting high court judge to be awarded a jail term by the apex court and also the first to have retired as a fugitive. A seven-judge bench of the Supreme Court, headed by Chief Justice of India J S Khehar, had on May 9 directed the West Bengal director general of police to take the then serving judge into custody immediately.